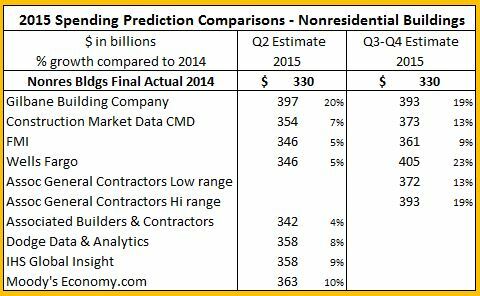 Nonresidential Buildings Construction Spending 2015 – How Do Industry Predictions Compare? Throughout the year a number of firms provide predictions of various construction data. Some firms provide estimates for all segments of construction. More firms provide estimates only for spending on nonresidential buildings. This is a summary of various firms estimates published in the 2nd quarter and also for those who’ve updated their estimate recently. The current available spending data through August allows an analysis of a select data set that gives a prediction of the year end result within +/- 1.5%. My current data predicts 2015 will finish with nonresidential spending at $393 billion, with a potential range between $387 billion and $400 billion. We will have even better data on November 2nd when the US Census publishes construction spending for the month of September. Once the September data is incorporated into the monthly totals, an analysis of a select data set provides a prediction of the year-end totals that has not varied more than +/- 1% from the end-of-year actual since 2002, as far back as the market data is available. The latest New Housing Starts numbers were released today. Residential growth is looking good and based on several inputs, I’m predicting an increase in residential construction spending next year. But let’s take a look at the variance you might get when looking at different data sets. I’m sure there are other reasons to consider as this is not intended to be a complete list of what might cause variances between starts and spending, but it does highlight that starts does not give an exact indication of the growth in spending. There is a fairly consistent growth rate in starts of 20%/year and yet construction spending in current dollars has been growing at only 12.5%/year. Furthermore, a sizable portion of that spending growth is just for inflation. After inflation is taken out we see real construction volume in constant 2015$ has been growing at only 7%/year. I don’t have an answer to explain these variances. I’m highlighting the data to show these variances exist and we can’t always rely on one data set exclusively. Perhaps this will initiate a discussion as to why these data vary by so much. 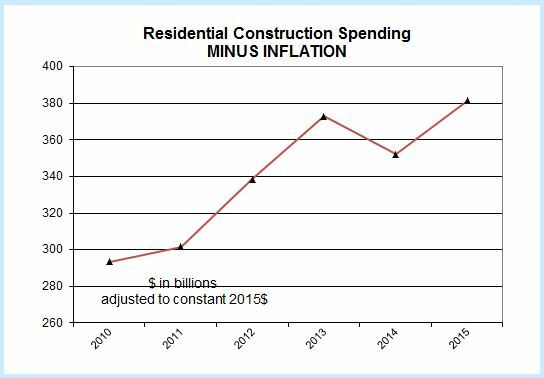 The Construction Spending BOOM in 2015 is being led by spending on nonresidential buildings. 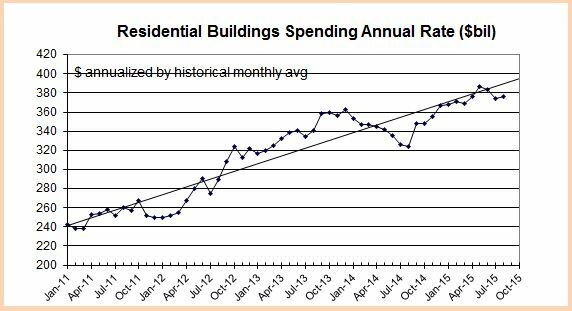 Spending on nonresidential buildings year-to-date (YTD) is +20%, +$41 billion. For housing the YTD is +11%, +$24 billion and for nonbuilding infrastructure projects YTD is -2.5%, -$5 billion. Let’s take a look at the current growth trends to find out where they are headed. In 2004-2006, residential spending was 55% of all construction spending. The annual growth in 2004 was 19% and in 2005 it was 15%. For the last 5 years residential spending has been only 32%-37% of total spending. In 2012 & 2013, residential led with annual spending gains of 13% and 19%. 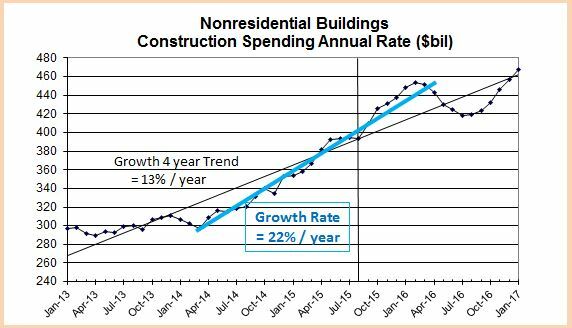 In 2014 & 2015, nonresidential buildings, also at 37% of total spending, led the gains at 9% and 19% growth. In 2016 the lead shifts back to residential with a projected growth of 14%. Infrastructure has not led growth since 2007 and 2008 when that sector had growth of 19% and 10%, at a time when residential spending was declining by 19% and 28%. We can get a very good idea of nonresidential buildings spending and growth by looking at the five major markets. These five markets make up 85% of all nonresidential buildings construction spending and half of total 2015 construction spending growth. More detail of how each market will perform, and why, follows. Spending in 2016 is projected to grow +5% over 2015. Other industry projections for educational spending in 2016 range from 1.5% to 12% growth over 2015, with the average of those seven estimates at 6%. As of August 2015, project starts that will generate 60% of all spending in 2016 are already booked. Starts for the first 8 months of 2015 were up 12% from the same 8 months of 2014. Educational spending increased only 4% year-to-date 2015 from the same period 2014, but the current annual rate of growth is 11%. Monthly spending is increasing and should continue to do so at least until mid-2016 before dropping off slightly into year end. Spending for healthcare is expected to remain flat with no growth in spending in 2016. Other industry projections for healthcare spending in 2016 range from 3% to 12% averaging 6% growth. As of August 2015, project starts already booked will generate 60% of all spending in 2016. New starts in 2016 generate about 25% of the total spending in 2016. If we get some very large new starts in the next few months, that could change total spending projections in 2016. Starts would need to increase 20% ( every month) over my projections for the next 16 months to reach 6% growth in spending next year. Starts for the first 8 months of 2015 were down 4% from the same 8 months of 2014 and most recently have been declining. 2014 starts grew only 2% over 2013. 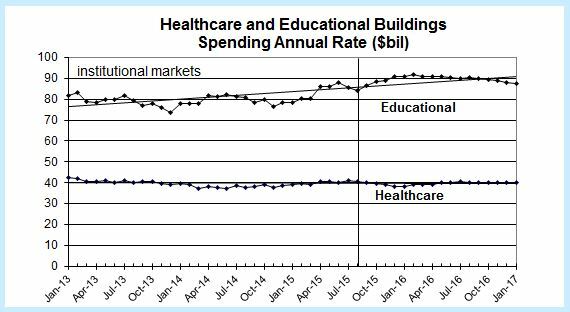 Healthcare spending had an annual growth rate of 5% in the first eight months of 2015. The decline in new starts signals a projected decline in spending for the next 8 months. Spending growth resumes in mid-2016 but at a very low 3% annual rate and that from an already low rate of spending at the start of the year. Spending in 2016 is projected to grow +7% over 2015. Other industry projections for office spending in 2016 range from 5.5% to 15% growth over 2015, with the average of those estimates at 10%. As of August 2015, project starts that will generate 55% of all spending in 2016 are already booked. Starts for the first 8 months of 2015 were up 17% from the same 8 months of 2014. Commercial spending increased 15% in the first half 2015 from the first half of 2014, but then spending declined by 8% in the last three months and may continue to decline for the next few months. Spending will resume a growth rate of 15% annual in the first 8 months of 2016. 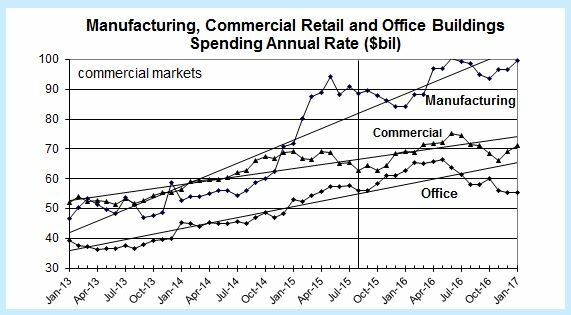 Commercial spending will peak in the second quarter 2016 before dropping again into year end. Spending in 2016 is projected to grow +8% over 2015. Seven other industry projections for office spending in 2016 range from 7% to 18% growth over 2015, with the average of those seven estimates at 12%. As of August 2015, project starts that will generate 55% of all spending in 2016 are already booked. Starts for the first 8 months of 2015 were 23% lower than the first 8 months of 2014 Spending from 2014 starts will start to drop off in late 2015 and early 2016 and based on new starts in 2015, by mid-2016 the monthly rate of spending will start to decline, keeping totals for 2016 to less than 10% growth. Spending on office buildings in 2016 will peak in the 1st half year with the 2nd half coming in 10% lower. Spending in 2016 is projected to grow +9% over 2015. 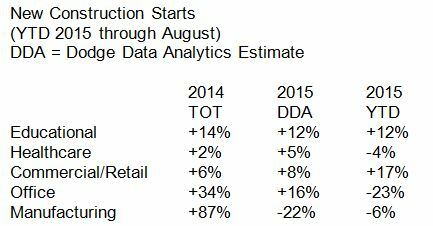 Seven other industry projections for manufacturing buildings spending in 2016 range from 5% to 18% growth over 2015, with the average of those seven estimates at 11%. As of August 2015, project starts that will generate 70% of all spending in 2016 are already booked. Starts for the first 8 months of 2015 were only 6% lower than the first 8 months of 2014. 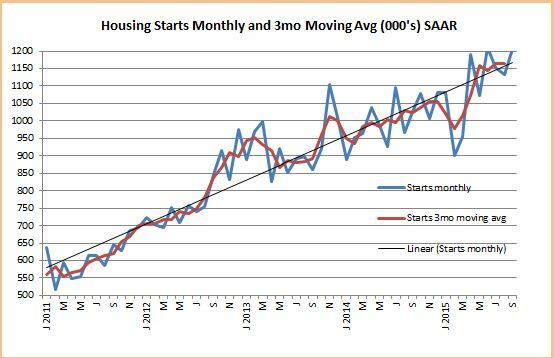 However, even if starts for the next 4 months increase each month by 50% they will still not equal the amount of starts in the last 4 months of 2014. Total starts for 2015 are projected to finish 20% lower than 2014. That’s probably a good thing since 2014 starts were up 87% from 2013, the highest annual growth ever recorded for any market sector. Spending from 2014 starts will start to drop off in late 2015. Spending reached a peak this year in the 2nd quarter but is expected to drop for the next five to six months. Spending on manufacturing buildings in 2016 will again peak in the 2nd quarter and then drop off into the end of the year. New nonresidential buildings construction starts cash flows indicate spending will continue to grow until Feb-Mar 2016, then drop consistently each month until Q3 2016. The decline is almost entirely due to big starts from Q3-Q4 2014 finishing and dropping out of the monthly spending numbers. New starts in 2015 did not grow as much as in the previous two years. Although the predicted decline in monthly spending over 6 months is 8%, 2016 may finish with a rate of monthly spending higher than when it started. The drop and recovery can vary from the predicted shown here and it’s not likely to be so smooth, but new starts from here on forward would really have to skew from a normal growth pattern by a lot to change this pattern by a little. Nonresidential buildings on average take about 20 to 24 months to complete, so every month we move out adds about 4% to 5% uncertainty to future spending. This prolonged period of spending declines is sure to cause alarm in the headlines in mid-2016, but the decline and the reversal are supported in large part by starts already booked. Unless something dramatic and unexpected comes along to throw a wrench in the works, I’m expecting a pattern like this for 2016. 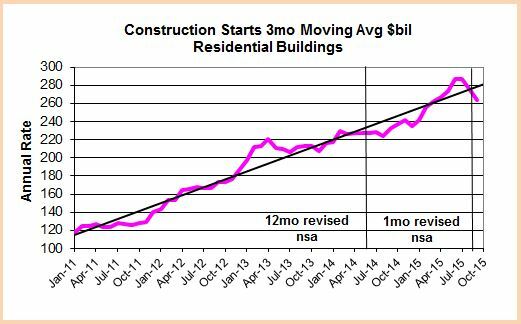 Total nonresidential buildings spending in 2016 will finish the year about 10% higher than 2015.